A year ago, when Manish Chugh, 36, and wife Zoyenka Chugh, 39, were driving from Gurgaon to their home in Mohali, along with their eight-year-old son Aryan Chugh, their car collided with a truck. While both father and son escaped with minor injuries, Zoyenka, who worked as a senior manager with Samsung, suffered multiple fractures on her skull and face, and went into coma by the time she was admitted to Fortis Mohali. She was diagnosed with meningitis a few days later, and continued in a semi-conscious state—she could see and hear but not reciprocate in any way. Manish, who owns a telecom business in Mohali, shelled out $35 lakh towards hospital expenses in two-and-a-half months, and decided it was time to bring her home, as “the doctors said that she would heal on her own”. And, “being at home” Manish adds, would mean faster recovery and lower infection rate. For almost a year from August 2016 till September last year, Zoyenka was under the care of HCAH (HealthCare atHOME). 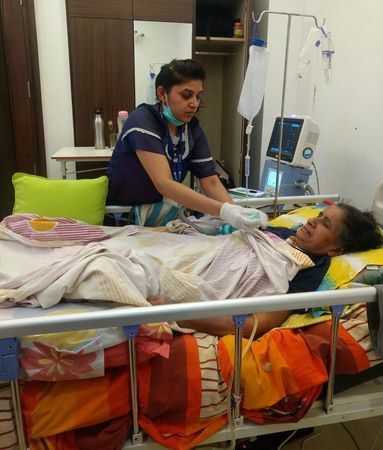 They sanitised the bedroom at her apartment, and installed medical equipment such as IV stand, para monitor, oxygen cylinder, suction apparatus to remove accumulated phlegm, alpha mattress for the bed, nebuliser, DVT pump to prevent deep vein thrombosis and a cardiac monitor to keep track of the vitals. A trained nurse stayed by Zoyenka’s bedside around the clock to administer injections, give medicines and check on her daily progress. Slowly, Zoyenka regained her consciousness and came out of coma. She can now see, talk, walk and is no longer bed-ridden. Manish paid HCAH Rs 7,500 per day for ten months. “Having an ICU-like setup at home is a wonderful alternative to a prolonged hospital stay. For us, it meant huge savings, peace of mind and a quicker recovery,” he says. Launched in 2013, HCAH caters to almost 30,000 patients across India at any given time. It is representative of an increasingly growing number of companies that provide health care at home; a concept which is catching up fast in India. 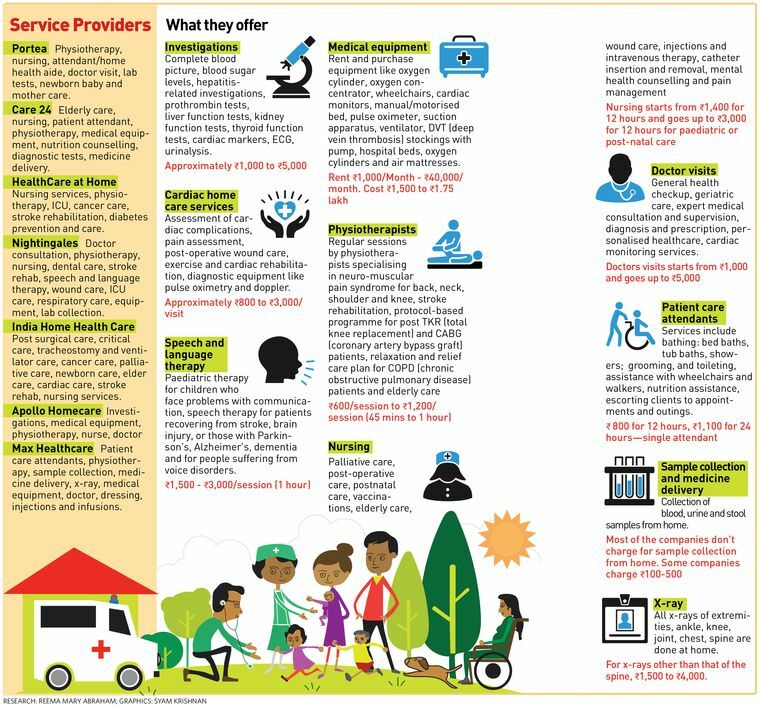 From turning one's bedroom into an intensive care unit (ICU), to assisting in post-operative recuperation and post-delivery care, home health care is emerging as a sustainable alternative to India's health care delivery system that relies on hospitals. And, the primary reasons for this 'shift' are—one, drastic reduction in expenses; two, low risk for infections at home when compared to a hospital; and three, the daily hassle of commuting can be done away with. “In India, the concept has emerged in the last eight to ten years,” says Vipin Pathak, CEO, Care 24, which provides health support at home, along with 24-hour assistance for patients suffering from conditions such as dementia, Parkinson's and paralysis. In the last few years, people have become more aware and assertive, and the requirement for home care has shifted from critically ill and aged patients to younger people asking for short-term diagnostic and preventive services,” he says. Accordingly, companies have expanded their service to include specialised form of care, such as peritoneal dialysis and chemotherapy right at the patient's doorstep. 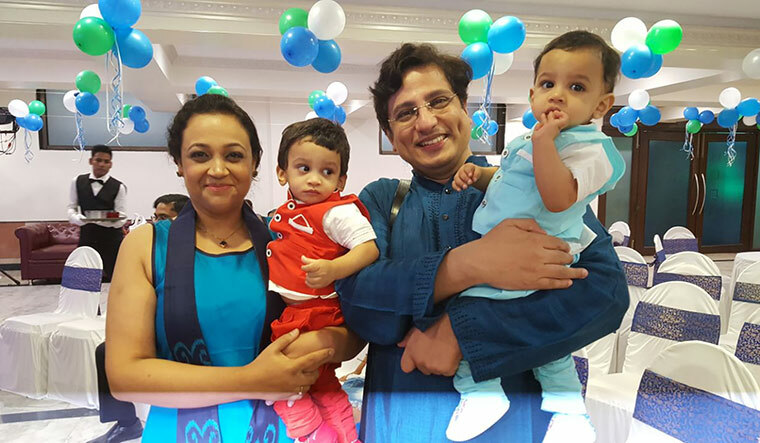 Twin Care: Rekha Desai and her husband Ashish kanvinde have employed two nannies for their twins and two nursing attendants for their parents. Vipin's company has witnessed a year-on-year growth of 100 per cent ever since they started operations in 2014. “We cater to one thousand patients every day in Mumbai and Delhi, and our margins range between 20 per cent to 30 per cent, while 70 per cent is our incurred cost,” he adds. Meena Ganesh, MD and CEO, Portea—a home care company that carries out 1,20,000 visits a month has over 50 doctors, and 4,000 staff, serving customers in 16 locations across India. She explains that the company has a centralised monitoring system that manages the workforce and ensures effective patient management. When a query is received at the call centre, basic details are taken, and the appropriate clinician is assigned—a nurse, a physiotherapist or an attendant. These clinicians visit the patient and the basic details are taken on a smartphone, which are then uploaded on to a central database or server. A patient record is generated, which is then emailed to the patient, her family, and in some cases, to the doctor who had cared for the patient at the hospital. “Technology has indeed made it all very professional and simple,” she says. Companies are also evaluating wearable medical devices, which can record patient data in real time, and can trigger alerts in the system for quick and pre-emptive actions. Rekha Desai and her husband, who live in Mumbai with their 18-month-old twins and their parents, use a mobile app to track the attendance, monthly payments, and daily tracking of the two nannies, and two male nursing attendants they have hired from Care24. Of the two nannies, one is on a 12-hour shift, and charges Rs 800 per day; the other, on a 24-hour shift, charges Rs 1,300 per day. Additionally, two male attendants—who come in alternate shifts for the father-in-law—charge Rs 700 per day. “The app is like a police inspector really. So if, for example, a help bunks her duty, it will automatically show on the app. Likewise, if I'm not happy with the services, I immediately give my feedback and the issue is sorted as soon as possible,” says Rekha. HCAH has a system they refer to as the 'E-ICU'. “It is a centralised system where all the home ICU patients are monitored from a central command system in Delhi. We have about 200 ICU patients at any given point across India. The home ICU also happens to be our most selling service,” says Vivek Srivastava, CEO and co-founder of HCAH. Some agencies provide chemotherapy services at home too. Dr Gaurav Thukral, CEO, HCAH, refers to breast cancer patient Geeta Singh, 61, who was treated at Sir Ganga Ram Hospital in New Delhi last year and had opted for a part of the chemotherapy treatment from the company. “Seventy per cent chemos in the west are done at home, so why not in India?” he asks. “We have done almost 25,000 procedures in home oncology and immunology, including chemotherapy and blood transfusions. It's a very simple procedure that requires high level expertise and knowledge. It can safely be done at home especially since radiation is not involved. We inject the drug that goes into the blood stream, through the Peripherally Inserted Central Catheter (PICC) line chemo ports attached to the arm. We get the doctor’s permission, before, during, and after the procedure. We let the patient be in the bedroom watching television, as we administer the chemo. We do not rush. Since it is the patient's home, we don't mind stretching it for hours, so that no reaction occurs.” The nurse who administers the drug is most definitely someone with a minimum five years experience in the department of oncology. Dr M. Udaya Kumar Maiya, medical director at Portea and an oncologist, says that there are also times when the companies deny home care to a patient. “For instance, in emergency situations, when the patient simply wants someone to come to him or her, for something like chest pain or may want the service in the next hour. But we are not able to provide it to them because of logistical reasons. There are trained personnel who will determine whether a case is worth home care or not, by talking to them at the helpline itself,” he says. The revenue streams for service providers include both annual and monthly subscription fees, and a per interaction fee. Customers either come directly to the service provider by word-of-mouth publicity or through referrals by doctors in hospitals, who want continuous care to be maintained for a particular patient. The staff are sourced from hospitals, skill training centres, nursing academies, and are trained in their respective specialties and matched to the patient's needs. But, these service providers make sure not to take on board any patient who might show even the slightest possibility of an emergency need. “If the patient is in a situation that will require the doctor's intervention on a continuous basis, then he is not a home health care patient at all,” says Vivek Srivastava, co-founder and CEO, HCAH. It was only a few years ago that the 'health care at home' industry became professional.“Before that post-hospitalisation care and nursing was done by the unorganised sector; there was no quality management, or focus on medical outcome,” explains Vivek Srivastava. According to an analysis by the Cyber Media Research (CMR), in the India Home Healthcare Report 2016, India's home health care market stood at around $3 billion in 2016, and is expected to grow to around $6.5 billion by 2020. “It's a very large market and we have just about started, while in the west it has always been there with a focus on nursing and palliative care,” explains Meena. Hospitals, too, such as Apollo Healthcare have now entered the field by establishing their own in-house home healthcare division—Unique Home Healthcare. Max Healthcare recently introduced Max@Home, its home-based healthcare service, backed by Max Healthcare’s 12-hospital network. The programme facilitates real time patient monitoring, by connecting doctors, dedicated case managers, trained nursing staff and emergency services through a technology-driven infrastructure. Manipal Hospitals and Fortis work with existing and emerging home healthcare partners. The report of the Cyber Media Research also states that home healthcare has the potential to replace up to 65 per cent of unnecessary hospital visits in India, and reduce hospital costs by 20 per cent.